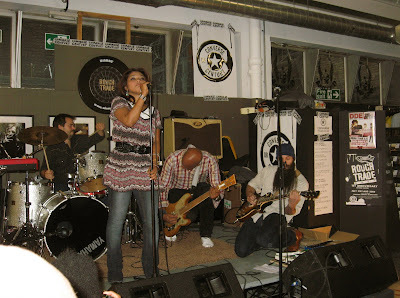 Last night I had the pleasure of watching my favourite band out of L.A. right now, Dengue Fever, play a free gig at Rough Trade East in London. Taking to the tiny cramped stage they plunged straight into a mixture of songs from their recently released album ‘Venus On Earth’. If you haven’t already heard their music, I’d describe it as a mixture of psychedelic rock meets Cambodian pop music with a heavy sprinkle of indie 60’s surf. Synchronized bopping and almost Shadows-esque swaying of guitars (and come to think of it, their guitar sound does have a hint of a speeded up, more twangy Shadows) from Zac Holtzman (formerly of Dieselhed) and Senon Williams (also of Radar Brothers) provided a great energy to the performance. After the show I took the opportunity to chat with their charming (and very tall) bassist Senon who informed me they have been in a studio laying down some new tracks over the last couple of days. Can’t wait to hear new material and can’t wait to see them again. I have my tickets booked for their next London show in November at the ICA, do you? I must also mention that Rough Trade is hosting an impressive lineup of free concerts over the coming weeks including Yeasayer, Adam Green and The Breeders. For more details check out their website. This is a track called 'Sober Driver' off their current album 'Venus On Earth'. There is also a film about the band’s recent journey to Cambodia called ‘Sleep Walking Through The Mekong’. Directed by John Pirozzi, the film follows them as they perform for the first time in Cambodia. Sorry to all you guys that missed out! Wow Chalky I'm jealous! I was just there too! 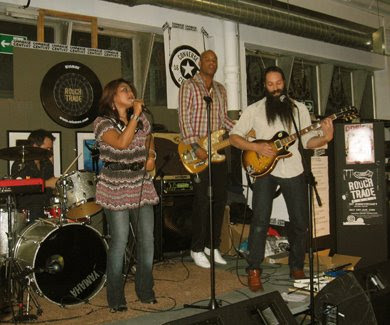 Too bad Dengue Fever didn't play a few days earlier I definitely would have been there. You should really go see Yeasayer. Although I wasn't a huge fan of their live show when I saw them open for Man Man they are still worth checking out if you haven't seen them. I'm glad there are still a couple of independent record stores around like Rough Trade, they make the difference. Nice staff who are happy to chat about music etc.